4 Bedroom End of Terrace House For Sale in Lowestoft for £400,000. An enviable position boasting uninterrupted sea views, this stunning home offers spacious accommodation over three floors, complimenting modern open plan living whilst occupying a premium location within a select gated community. Leading into a welcoming entrance hall, the stunning kitchen/dining room overlooks the front aspect into the bay window. Fitted with beautiful neutral cabinets, this is a social space for dining and everyday living. The utility room leads from the rear of the hallway next to the study which could also serve as a fourth bedroom which benefits from double doors to the rear garden. Rising to the first floor, the sitting room soaks up the best of those spectacular sea views and leads out to the private balcony. Double doors allow the sitting room to flow beautifully or equally allow for a separate space for a television area or some peace and quiet to read. On the third floor, all three bedrooms lead from the landing in addition to the family bathroom. The master suite resides to the front of the property, boasting an en-suite shower room and again boasting those striking views. 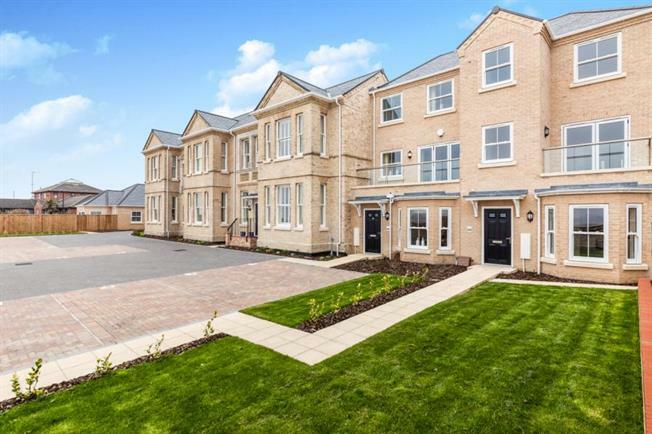 Outside, the property benefits from two allocated parking spaces to the front and an enclosed low maintenance garden to the rear.